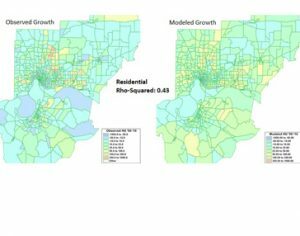 Land-use forecasting | Resource Systems Group, Inc.
RSG’s expertise in land-use forecasting ensures planning organizations (e.g., state DOTs, MPOs, municipal governments) that their planning processes are backed by well-reasoned, detailed demand analyses. Our forecasts are used for understanding transportation and land-use interactions, enabling these agencies to more confidently evaluate policy and planning alternatives. As each urban area represents a unique land development market, land-use forecasting work requires detailed, local knowledge of both current conditions and the “development pipeline.” We work closely with our clients to specify and calibrate appropriately sensitive modeling tools, tailored to their needs, and provide the training needed to make them productive.